I recently noticed a CNET post about the in-dev version of Mozilla Firefox, a browser I had used on occasion, mostly under Linux. I was aware that it was the popular alternative to MS Internet Explorer, and until recently I didn't completely understand why. I only first tried Firefox in 2007, when I was in IT at Cook. It was certainly stable, and the password remembering feature was obviously more advanced (some would call it less secure) than that of MS IE7. I wasn't quite as impressed with the UI, as I had gotten used to the refresh and stop buttons being on the right side of the browser in IE7. I'd have to agree with most of the claims of the intro page seen above. Besides, check out the cheerful robot dude! Very cool, somewhat representative of the open source feel that is the Mozilla Foundation. Very geeky. The browser is certainly faster, takes less memory than either version 1.5.x or 2.x, and has a smoother look (particularly the back/forward buttons, something I felt was lacking in the previous version.) I haven't seen any major rendering differences in the Gecko HTML rendering engine under the hood, but I have a doubt they'd break it. I've been using this for about a week, and look forward to the final version. Now, there is another beta critter out there, and it seems to have fixed HUGE amounts of problems. It's Microsoft Internet Explorer 8 Beta 1. I hate to sound biased, but I don't like IE 7.0. I used to not be indifferent towards IE, but...well, let me explain. I recently began my largest web project ever, a page for a local museum. It's my first page that is based on Cascading Style Sheets (CSS). Granted, it's prebuilt CSS, in the form of the Joomla! 1.5 Content Management System, albeit heavily customized by me. While in the development of this site, I'd run across freaky problems. First, the bottom of the menus would fuzz out in any version of Internet Explorer, if you scrolled them off the screen on the longer pages. 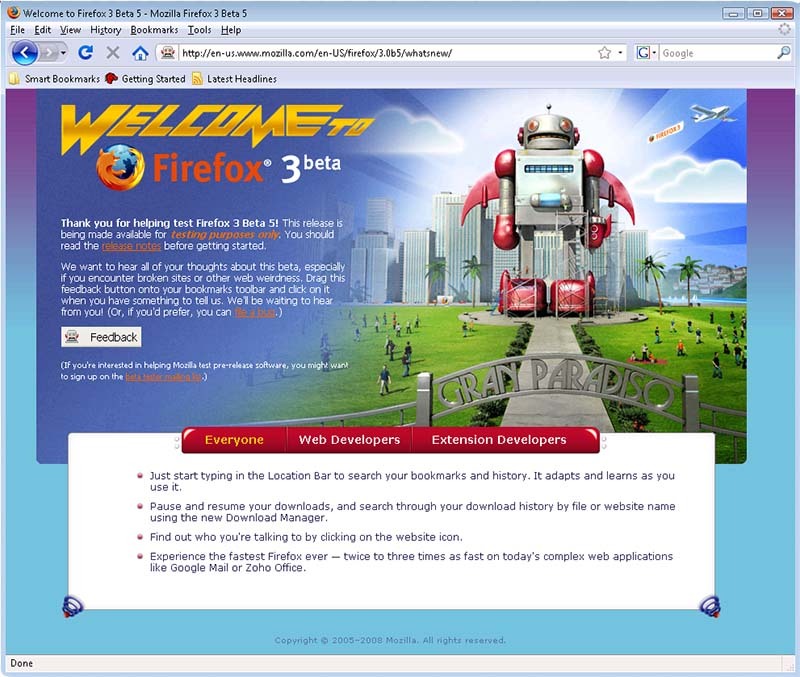 So, I downloaded the latest release of Firefox 2.x to have a look at the page. Lo and behold, it works fine. I was told it was looking fine in Safari on the Apple Macintosh too, as well as under Opera, and Linux versions of Firefox and browsers like Konqueror in KDE (Unix/Linux etc). So, based on this, and other crazy CSS formatting problems I'd have in IE (where pages would look great in other browsers, but break in IE), as well as learning that Internet Explorer 6 (likely the most prevalent version of IE still out there) can't explore transparant .png graphics files (The transparant portions appear in an aqua-blue color), I developed a rather heated hatred for Internet Explorer in a relatively short timeframe.